Awww! Shammi, Shashi, and Rekha at the Filmfare Awards! That was exactly what I needed to get my weekend off on the right foot. Happy Friday, everyone! And Rekha doesn't look crazy!! Shashi-ji has lost weight, nahin? I beleive Shammiji has been feeling rather unwell, and Rekha looks like a dream! Rekha is a lucky lucky girl here! This is a precious pic. I had heard that Shashi was living in London with his son Karan, who takes good care of him. It was awesome! :D I was there! Did you know Shammi Kapoor drove ALL THE WAY from one side of town to another in heavy traffic?! Awesomeness! What a great picture! Is Shammi in a wheel chair? How does Rekha manage to keep her looks without gaining weight? Rekha is eternal beauty...Shammi ji is in black suit. But Shashi ji looked not so well. He was on wheel chair at the stage and even did not give acceptance speech but had tears in his eyes. Beth I watched this last night!! Shashi was all teary eyed on the stage...I felt like jumping into the TV and giving him a HUGE HUG!! Old world certainly has its charm. It truly is gold! And here's the link to an interesting video I found of Shashi. I've never seen any of his old interview videos so this was such a treat!! Oh that face! Oh those eyelashes!! And oh that mesmerizing way of speaking!! Ahhh! Christy - Rekha looks GREAT! She does sometimes bring the crazy, it's true - like in Om Shanti Om. I think I want to be Rekha when I grow up. Or now, even. memsaab - Right? That's going to be you someday, I just know it. Like, the next time you go to India. Jugal - The Kapoors are just made of awesome through and through (except for the alcoholism, which they clearly need to get help for). I love how all of them look alike yet not exactly the same. Powerful genes! Richa - YAY!!!! Glad you got to see it! I agree, hugs for Shashi are very necessary. Haven't seen the video - thank you for sharing! I am eagerly awaiting Shashi Week!! What a great picture. 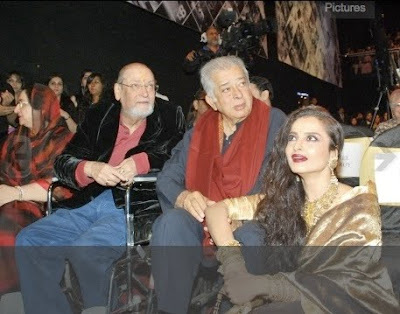 And I love Rekha sitting by their side, looking all shiny and gorgeous. i looooooove this pic! and yes, i got totally weepy-eyed watching Shashi get the Filfare Lifetime Achievement Award!